When Martin Amado was a child, he loved to rearrange furniture, paint walls and buy new bedding for his bedroom. Design was his passion, but later he wanted to have a career in broadcasting. City & Shore: What do you call yourself? Martin Amado: A home décor and lifestyle expert. MA: Design is in the details. Furnishings alone and a high price don’t necessarily translate to high style. A room is designed in layers. Each is equally as important so in the end you have a cohesive design that is a true reflection of the client. C&S: Why doesn’t good design have to be expensive? MA: I avoid custom-made. You can buy good design with a high-end look in stores like HomeGoods, Z Gallerie, Marshall’s and Pottery Barn and in catalogs like Ballard Designs. I also recycle a big portion of what the client has. The result is an updated look combining old and new pieces. C&S: Do you have clients outside your TV show? MA: I work with clients through my home-styling company, The Wow Factor! 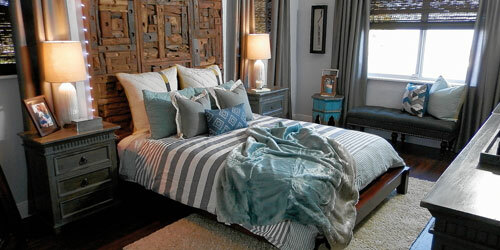 I specialize in one-day makeovers working with a minimal budget to achieve a decorator look for less. C&S: What are you sorry you didn’t buy for yourself? MA: I’m constantly shopping for makeovers. There is always something beautiful, unique – what I consider to be a ‘shopping find.’ But as much as I would want it for my home, I just don’t have room for it. Luckily, I’m able to get it out of my system through my work, since I can still purchase it and use it in a client’s home. I’m able to enjoy it vicariously through them. C&S: Do you do any charity work? MA: I’ve worked with Habitat for Humanity decorating spaces for first-time homeowners and families in need. I also redesigned the playroom for the Ronald McDonald House Charities of South Florida; the reception area for the His House Children’s Home; and have collaborated with ChildNet, Lighthouse for the Blind, International Kids Fund and public schools. It’s rewarding to work on these charitable projects and see the joy design brings to others.